Samson Greene, a young and popular professor at Columbia, is found wandering in the Nevada desert. When his wife, Anna, comes to bring him home, she finds a man who remembers nothing, not even his own name. The removal of a small brain tumor saves his life, but his memories beyond the age of twelve are permanently lost. Here is the story of a keenly intelligent, sensitive man returned to a life in which everything is strange and new. An emigrant from his own life, set free from all that once defined him, Samson Greene believes he has nothing left to lose. So, when a charismatic scientist asks him to participate in a bold experiment, he agrees. Launched into a turbulent journey that takes him to the furthest extremes of solitude and intimacy, what he gains is nothing short of the revelation of what it means to be human. Nicole Krauss was born in New York in 1974 and lives in Brooklyn. She has published in Esquire, The Paris Review, and Best American Short Stories. 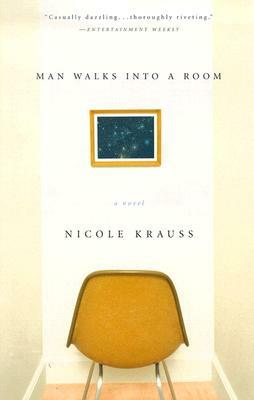 Called "one of the most impressive debuts of 2002" by Esquire, Man Walks Into a Room was a finalist for the Los Angeles Times Book Award.